The Old Hag Syndrome is the superstition that a person could awaken to find an old woman or a hag sitting on their chest, not allowing them to move or breathe. The incubus and succubus were also part of this belief system but they were demons who would take a sexual advantage of someone sleeping. Today medicine recognizes this problem as sleep paralysis or night terrors, the inability to make voluntary movements when awake. These episodes can also be associated with visual and/or auditory hallucinations. If, in the 1600s, you heard stories about a “hag” sitting on your chest in the middle of the night, then that was likely what you saw. 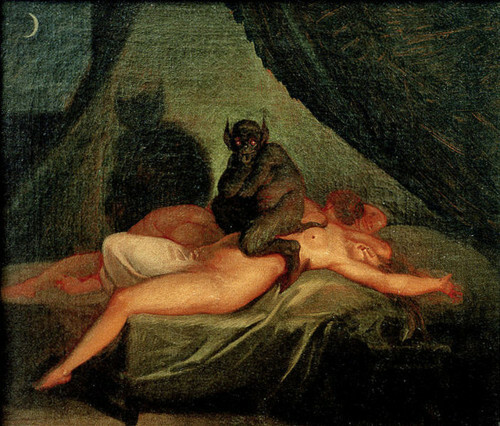 Sleep paralysis is still common today. However, it may be known by another name: alien abduction. Yes, scientists feel that the many stories of alien abduction, especially those (like Mulder’s sister) that occur at night or while someone’s sleeping, are probably sleep paralysis with hallucinations. Hundreds of years ago, one would expect a demon sitting on their chest. But in the 21st Century—well, the “hags” are little gray beings. Who’s susceptible to sleep paralysis? This usually occurs in people whose circadian sleep rhythm is disrupted—people who work several different shifts—and people who have panic attacks when awake. Prevention is simply (?) going to sleep at the same time every night, reducing stress, and getting enough exercise (but not immediately before going to bed). All of that may be easy for some and more difficult for others. I can’t remember having sleep paralysis as an adult; however, I have had what is called “exploding head syndrome”—hearing loud explosions that wake you up but there was nothing. One night I thought I’d heard a huge explosion and immediately called my daughter who worked at the local newspaper. Surely she would know if something had gone up. Nope, nothing. Yep—exploding head syndrome, another way the brain plays tricks on us. Maybe it really IS aliens?